If you are looking to get some new cutlery for your kitchen, there are many options currently available that will provide you with different qualities, features and levels of performance. In fact, there are a plethora of factors that can determine your choice, even the brand name. The majority of us think that the best knives are expensive. Well, there is a certain truth in this, but you can also get decent cutting knives in the entry and mid-level price categories. Rada Cutlery is proof of that. Rada Cutlery is a kitchen tool manufacturer based in Iowa, America. The utensils are durable, ergonomic and brimming with quality. If you don't believe me, go check out the independent testimonials of people who have used these tools. You can also check out the Rada Cutlery reviews that I've written below to see why this brand is so popular nowadays! The first one I encountered was this beginner knife set from Rada Cutlery. The package offers a variety of knives that work well in any cooking application. Everything you need, from a paring knife to tomato slice, is present in this package. Once you have got this set in your kitchen, your ability to cut and slice will be greatly enhanced. The Rada Cutlery Starter Gift Set offers seven knives that are made from high-quality materials, so their edges won't get brittle easily. The handles are cast silver aluminum with a satin finish. You should always hand wash this cutlery, so make sure that you don’t stick them in your dishwasher. These knives are easy to use because they are so gentle on your hands. They won't let your palms or fingers get sore, regardless how much you use them. Their impressive usability can also be attributed to the sharpness of their blades. The knives in this gift set are sharp enough to turn common meat and hard veggies into pieces. Another excellent Rada Cutlery package that I adore is the Cooking Essentials Gift Set. Unlike the first gift set that I recommended earlier, this one only comes with three knives: a paring knife, steak knife, and tomato slicer. But this is not a problem, as you can slice, dice, and peel with utmost precision and agility with these knives. In fact, they are among Rada Cutlery’s top selling knives. All of the blades have been crafted from industrial-grade stainless steel, which is famous for being extremely durable and sharp. They are a delight to use, and by practicing with these knives, you can really hone your cooking skills. You might even attain professional cooking results, which is always a great thing to dream of. The handles of the knives are made from a stainless steel resin that is dishwasher safe, unlike those in the Rada Cutlery Starter Gift Set. Some say that hand washing is a better and safer choice, but if you don't want the hassle of hand cleaning them, then it’s fine to put these knives in the dishwasher. Are you a huge fan of steaks? If the answer is yes, then the Rada Cutlery Utility Steak Knives Gift Set will be perfect for you. Each of the knives here is a top-selling steak knife. They all are around 8 1/2 inches long, and the blades are roughly 4 3/4 inches. Nobody can resist these knives. Just by looking at them, you can see they have all been constructed to the highest standards. They look sleek and elegant, which makes them perfect to display in your kitchen. The knives are also moderately weighted, so they are neither too heavy, nor too light. This means they will offer you just the kind of maneuverability that you need to cut thick slices of steaks. The blades are slightly longer, compared to other steak knives, and unquestionably sharp. The edges are non-serrated too, which enables them to have a quick bite on the flesh. As well as being perfect for steaks, you can use the Utility Steak Knives to slice and dice other kitchen ingredients because they are sharp, flexible, and practical. This set is something that you should definitely include on your shopping list as you will be astonished by the quality and performance that each of these paring knives offer. The knife set includes the following cutlery tools: a peel paring knife, heavy duty paring knife, and regular paring knife. They all have different blade sizes, which allow you to use them in different cooking applications. You won't need any other options once you get your hands on this package. Even I was dumbfounded by their quality. This knife set comes in an ergonomic case, which prevents the blades from losing their edge and sharpness, and inserts have been form-fitted to the knives, which will keep them in place all of the time. In short, this case acts like a portable knife block. Just like the Rada Cutlery Utility Steak Knife Set, the handles of the Paring Knife Set are dishwasher safe. This is because they are made out of a stainless steel resin that won't get damaged in the machine. The handles are smooth and gentle to your hands as well. They provide a good grip, which is essential if you want to tackle hard meat cuts. There is also a blade guard that will protect your hands from slipping through the blades. 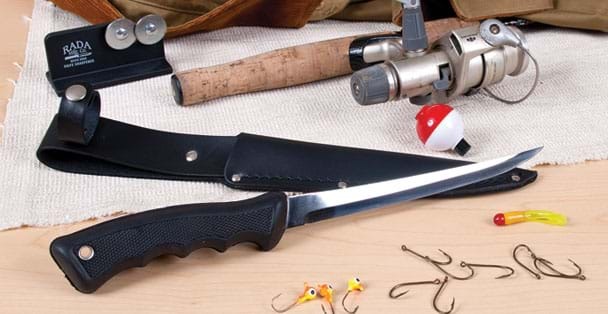 Dealing with fish is not that easy, especially if you just use ordinary knives. You might want to try an electric fillet knife, but for those who cannot afford this tool yet, you can grab this offer from Rada Cutlery. They have a fillet knife that can easily cut any variety or size of fish. If you are fishermen or a fish lover, this fillet knife should be present in your kitchen. The Rada Cutlery Fillet Knife is impressively light, flexible and durable, as the sharp blade is crafted from surgical-grade high carbon stainless steel. The blade was not sharpened by any machine. Instead, it was hand-sharpened by skilled cutlery workers. This level of engineering and construction means the knife can easily cut through fish, right down to the bones. The grip of this fillet knife is superb as well. The handle’s black rubber cover enables you to hold it with precision and safety. There are also crevices on the knife that enhance your finger grip. As a result, the knife can offer you a slip-free performance, even if it is wet. The craftsmanship and quality of this fillet knife means that it can be used by simple house cooks and professionals alike. You will never go wrong if you try this knife. The Rada Cutlery French Chef Knife is a versatile knife with a premium build and performance that makes it arguably one of the best professional chef knives on the market today. It that you can use to chop, mince, and dice different ingredients in your kitchen. The knife will do all the dirty work for you, even if you don't try hard, leaving you with professional-grade results. The 8 1/2-inch blade of this French knife is durable and razor sharp, with a great cutting capacity, enabling it to cut through hard ingredients with ease. The T420 high carbon stainless steel blade is of surgical grade, so it is extremely sharp and precise. Another good feature of the knife is its handle. This is smooth and provides a non-slip performance, even if things get too wet. It can also offer the control and maneuverability that kitchen chefs require. The only drawback is there’s no blade guard between the handle and the blade. Considering this knife is extremely sharp, you should always exercise caution while using it. Overall, nothing should discourage you from getting this French knife from Rada Cutlery, it will certainly impress you. This dicer knife will be able to help you out when you’re cleaving hard vegetables or meat. It is a professional dicer knife that works well in restaurants and other cooking businesses, and is an ideal choice for cutting ham, ribs, and chicken wings. In fact, any tough ingredients that need to be diced or cleaved can be dealt with by this cutting monster. The blade of the knife measures around 5 1/4 inches, which is long enough to cut large pieces of meat and vegetables. The blade is powerful and rugged enough to slice through bones like they are nothing. The T420 high carbon steel construction of the knife means it can do the job with ease. It has been hand-sharpened too, which ensures its quality and durability. The entire knife is neither heavy nor light, which makes it easier to control than its counterparts, and the weight is balanced between the blade and the handle, which provides superior mobility. Its high level of ergonomics make it easier to grip, and the better the grip on your tool, the less chance there is that accidents will happen. The blade does not get dull or blunted easily because of its high carbon stainless steel construction, and you’ll find that cleaning will never be a problem, since it is dishwasher safe. Apart from its cutting tools, Rada Cutlery is also a leading manufacturer of kitchen utilities. You will certainly love the fact that all of the company’s items and materials are crafted in the United States. They usually offer a lifetime warranty for each of your purchases. The same goes for with the cutlery tools that I’ve featured above. Sometimes, you just want a kitchen utensil set that will give you all of the things that you need. If you are into cooking pastries or pizzas, you should definitely try the Rada Cutlery 4-Piece Kitchen Utensil Gift Set. Dubbed as the ultimate kitchen utensil set, it comes with an ice cream scoop, serrated pie server, spatula, and the ever-endearing pizza cutter. If you don't have a pizza cutter yet, this package is a good alternative. All of the utensils are made out of 300 series high nickel stainless steel, which is an industrial-grade material that’s food safe and has passed all the FDA standards. With such a design, you can expect the utensils to be very durable and ergonomic too. They will never leave you disappointed. These utensils are made to cater for the needs of simple house cooking applications. I cannot say that they could be used for commercial purposes, but I do know they are perfect for your private events and parties, as using them will never stress you out. Preparing dishes is difficult if you don't have a reliable cooking spoon at your disposal. Of course, you can find one in your local market and stores, but if you want something that offers you more, try this cooking spoon from Rada Cutlery. Large in size, it offers a heat-resistant feature. The spoon keeps the heat from transmitting, so you won't have to wear kitchen mittens or gloves. Furthermore, it has a bowl-shaped head and an even nose, which ensure the spoon can be easily used for serving and stirring. The durability and toughness of this tool are also both impressive. I was surprised that the stem of this spoon is crafted from high nickel stainless steel, a material which is notorious extremely sturdy, even when it is subjected to extreme heat. Despite being moderately priced, this cooking spoon will last longer than most of its counterparts. You can use this tool on many delicacies, including macaroni cheese, lasagna, potato salad, and much more. The tool is dishwasher safe and will never compromise the convenience of your kitchen. A soup ladle is another essential cooking utensil you should have in your kitchen. After all, most of us love to savor the creaminess and texture of soups. We can't do it properly, however, if we don't have the right tools to work with. A large ladle soup like this one from Rada Cutlery will give you the versatility required to handle different soup recipes. Apart from soups, this ladle can also be used when you make and serve sauces, gravy, and stews. Since it is a large ladle, it can contain up to a 1/3 of a cup of liquid. The measurements of the ladle's bowl are around 2 3/4 inches x 3 1/4 inches, which is ideal for cooking soups or stews in large servings. The body or stem of the soup ladle can resist common kitchen detriments and is made to resist high temperatures. Its quality doesn't diminish even if you subject it to heat constantly. Meanwhile, its handle doesn't heat up and can be held comfortably. There is also a hole on the end of the handle where you can hang the ladle. By the way, the handle is crafted from reinforced nylon that has heat rejection capabilities. Washing this utensil is not that difficult, as the entire body is dishwasher safe and has passed the food safety standards of the FDA. A wire whisk might not sound like a priority for you, but once cooking grows on you, you'll realize that this tool is important too. The Rada Cutlery Wire Whisk is very different from the ordinary wire whisks that you can see in the markets today. It has a practical yet intuitive design that allows you to use it easily and conveniently. It can reach and grasp even the tightest of corners in your pans and won't miss a spot because of its unique wire design, so it is a good choice for mixing gravy, sauces, batters, and gelatin. This wire whisk can handle any liquid and semi-liquid mixtures. The shaft and spring of this utensil are durable and rugged because they are made out of innovative high nickel stainless steel. They don't cause any harm to the food either. The spring has been ergonomically shaped so that food will never stick to the tool, regardless of its texture. Therefore, cleaning it is not that difficult, even if you can't wash it in your dishwasher. The handle of this tool is made from cast silver aluminum that comes with a satin finish, so it "feels" good in your hands, and will improve your control over the wire whisk. A metal grill spatula is an indispensable item for grilling applications. That's why a lot of people are searching for this product to use at their upcoming tailgate and backyard parties. One of the options you should consider is the Rada Cutlery Metal Grill Spatula, as it can be freely used both inside and outside your kitchen. It is an excellent choice for making burgers or frying meat, fish, and veggies, and can also be used to retrieve pastries, like brownies or cookies, from a scalding sheet. Since it has a flat head, scooping those treats will never be an issue. Just like the rest of the tools here, the head of this spatula is made from high nickel stainless steel. Its face or the head is noticeably larger than most of its competitors. This design is needed to grill and cook chunky ingredients. The ridge of this utensil (the area where the head and the handle meet) is rigid, which will improve your ability to handle and maneuver food. Regardless of how sticky or large the food is, the ridge remains stable, and the handle has cool-touch features that stop your hands from being scorched when you’re dealing with food items close to the fire or heat element. All knives, regardless of their brands, are useless if the blades are blunt. It is a brutal but honest fact. If you care for your knives and other cutlery utensils, it is imperative that you invest in a sharpener. You can either go for a manual sharpener, an electric sharpener, or a stone sharpener. It doesn’t matter which you choose because they are all good, and as long as you’ve got one, your knives will always be in top shape. One of the finest sharpeners that I have tried is the Rada Cutlery Knife Sharpener, which has a construction and design that is different from the conventional knife sharpeners that you see today. The steel wheels are affixed to the main body of the sharpener are positioned in a way that sharpens any knives at an optimal rate. The only thing that you need to do here is to run the blade through the hardened wheels until their sharpness is restored. Perhaps the only downside here is that this sharpener has been designed for knives produced by Rada. I am still not sure if other knife brands are compatible with this tool. So, for now, it is best just to use it just on Rada knives. Overall, you should never underestimate the quality of Rada tools. Even if they are not the leading producers of kitchen utensils, they are doing well in a competitive market. Moreover, most of their tools comply with the modern standards of the culinary world, and their design and engineering ensure they are all food-safe. I hope these Rada Cutlery reviews will have introduced you to the quality of this brand. If you know other kitchen utensil brands that are worth featuring, then let me know in the comments section below, and I will do my best to research and introduce the capabilities of their products! The Best Oyster Knife For Shucking Hard Shells! The Best Electric Fillet Knife For Pros And Amateurs Alike!